Nutrition is an important part of your training programme. Eating the right types and amounts of food, as well as drinking enough fluid before, during and after each training session will help you perform better and recover faster between training sessions. It will also help to keep you healthy and reduce your chances of getting colds and other upper respiratory tract illnesses. Here are some nutritional strategies that can be used to improve your training sessions. Swimmers need a nutrient-packed diet to fuel their bodies during training, as well as adequate protein for growth and muscle repair, and (mainly unsaturated) fat for fuel and overall health. A general guideline for training days is to have one third of the plate carbs (pasta, bread, rice, potatoes, or cereal), one third protein (fish, chicken, lean meat, eggs, beans, lentils, tofu) and one third vegetables. You should also include healthy fats (olive oil, oily fish, nuts) and at least 5 portions of fruit and veg a day to ensure you get the omega-3 fats, vitamins, minerals, fibre and other protective nutrients needed to stay healthy and promote recovery. A 2-hour training session early in the morning will certainly tax your body’s carbohydrate (glycogen) stores. Without anything you may feel ok for the first half of the session but devoid of energy for the second half. Training on empty may result in low blood glucose levels, early fatigue, light headedness, nausea and a poor performance. Try to have nutritious high-carb foods, such as porridge, wholegrain toast with honey, a banana (or other fruit), a fruit & nut bar (e.g. Nakd) or granola. Can’t face any solid food? Try a nutritious drink, such as a smoothie, or a yogurt. Some fuel is better than no fuel at all. Have plenty of water to rehydrate after the night’s sleep. Re-fuelling within 30 minutes after training is especially important if you’ll be training again in the evening. This will help your muscles recover faster. Suitable foods include porridge with fruit and nuts; strained Greek yogurt with fruit and nuts; eggs and toast; wholegrain cereal (e.g. granola, muesli or Weetabix) with milk and yogurt. Make sure you eat at regular intervals and never skip meals. The more active you are the more fuel you’ll need. If you train in the evening, your earlier meals and snacks will help to fuel your workout. The optimal time for the pre-exercise meal is 2 hours before training. If your training session starts at 7pm, have dinner at 4 – 5pm. Aim for ‘comfortably full’, not stuffed. If training starts at 5pm, then have a smaller meal or healthy snack 3 or 4pm, with a drink. If you don’t eat before training, you will lack energy in training. If you eat too much or too close to training, you will feel uncomfortable, heavy or nauseous. Of all the foods you could have before a workout, prioritize ones rich in carbohydrates, especially if you will be training for 2 hours. This is the body’s preferred energy source during exercise. Opt for wholegrain carbs wherever possible, together with a source of protein and some veg – this will provide sustained energy and improve performance. If you don’t have time for a meal (eg early morning training), have a snack 30 min before training. Start re-fuelling with carbs and protein within 30 minutes after training, even if it’s late in the evening. This will help your muscles recover faster and you’ll feel better in the morning. If you had only a snack before training, have your dinner when you get home. 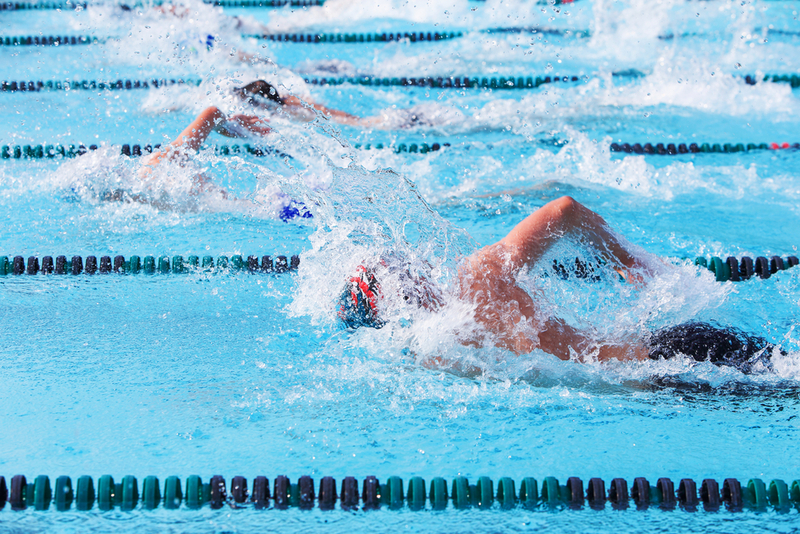 Dehydration slows you down and will make swimming feel much harder. The most important thing is you arrive at your training session properly hydrated, (you can check for dehydration with the ‘pee test’). Drink plenty during the day, little and often. Have around 250 – 300 ml 2 hours before the session. During training, drink little and often e.g. 3 – 4 gulps every 15 minutes (or at convenient intervals), rather than a large volume in one go. Drink plenty after training to aid recovery. Depleted reserves of carbohydrate in your muscles (glycogen) – avoid this by eating a balanced meal containing carbs and protein (and some fat) about 2 – 3 hours before training; eat consistently during the day; do not skip meals.